Banner Thunderbird Medical Center is the 4th largest hospital in the greater Phoenix area providing 513 beds on a 33-acre campus. BTMC is located in Glendale and provides a wide range of medical services including behavioral health, cancer care, robotic surgery, medical imaging, ob/gyn, rehabilitation and pediatrics. 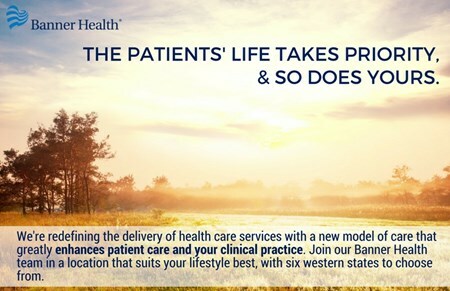 Banner Estrella Medical Center is located in Phoenix, and has been regionally and nationally ranked by U.S. News & World Reports. Located at the 10 and 101 freeways, BEMC was built in 2005 to meet the growing needs of the West Valley. The 208 all-private bed hospital offers an array of medical services, including ambulatory care, general surgery, medical imaging, orthopedic services and a comprehensive women and infants services program. Banner Estrella also offers and encourages the use of complementary healing treatments, such as pet therapy, spiritual care and meditation. Banner Del E. Webb Medical Center has grown with the booming retirement population and the increasing number of families moving into areas surrounding Sun City West. With its new wing built in 2009, BDWMC now has 404 licensed beds. It excels in providing acute medical and surgical services as well as intensive care, inpatient/outpatient surgery, neurology, cancer care, urology, pulmonary, ob/gyn, diagnostic services, acute and outpatient rehabilitation and adult behavioral services.